For some, the mention of “healthcare” brings to mind doctors and nurses — the people on the front lines of the medical industry. But, as with any other industry, there is a business side to healthcare. The healthcare field also needs people with expertise in areas like policy analysis, finance and accounting, budgeting, human resources, marketing, and information technology. Successful healthcare operations also need leaders who can navigate a difficult, constantly changing landscape. Tom Selden was one of those leaders. He says one of the questions he is asked most often is, How did a mechanical engineer end up running a hospital system? Portrait of Thomas Selden. Photo by Jason Miller. Selden’s first experience with healthcare came in the military. After graduation, he was commissioned as a second lieutenant in the U.S. Army in 1971 and served in the infantry, returning home with an obligation to continue his service in the U.S. Army Reserves. He chose a position in an Army hospital. 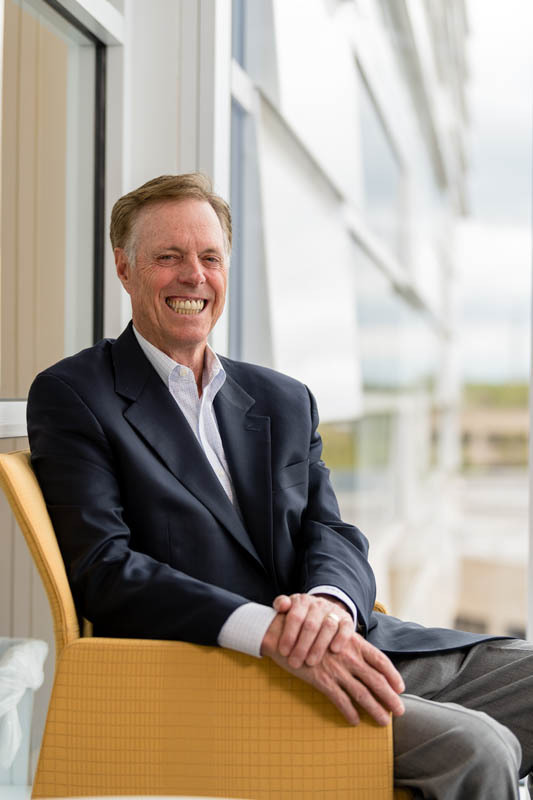 The prospect of sleeping off the ground, combined with the leadership skills he developed at Missouri S&T and honed in the military, led Selden to a 30-year career in the healthcare industry. But that career didn’t start right away. While working in hospital administration in the Army Reserve, Selden spent several years as an engineer for Firestone Tire and Rubber Co. He earned an MBA along the way and advanced into strategic planning and marketing. He also learned one of the most important things a successful hospital administrator needs to know while working in the Army Reserve hospital. During his career, Selden took over — and turned around — two troubled hospitals. Over the years, he overcame many challenges. One of the biggest evolutionary changes he encountered was the move away from paper medical records. That very challenge is what led Beth Baumbach, CerE’90, to the healthcare field. She had spent 15 years as a ceramic engineer in product development for Sunnen Products Co. before moving to BJC HealthCare in St. Louis. Because it wasn’t about healthcare experience, it was about work flow. A routine checkup, for instance, has much in common with a manufacturing process, Baumbach says. Baumbach was hired in August 2006 to take on the medical group’s switch to electronic health records, and by November she was expected to take the first pilot live. She hired a team and got started on two pilot practices. They observed current operations, looked at where they needed to go and then assessed the gap — what had to be done to move their records from paper to electronic. “We went workflow by workflow, role by role, visiting each practice to talk with the staff and providers and developed an implementation strategy and model to help them transition. 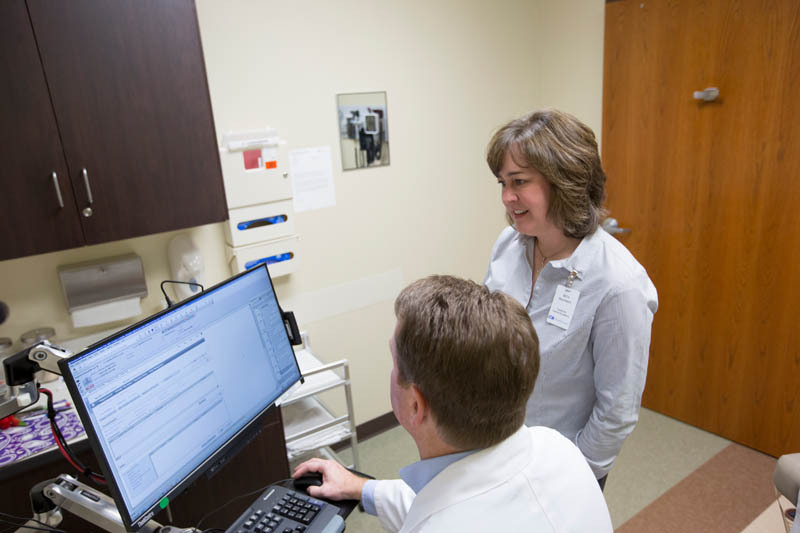 Baumbach and her team expanded their roles to optimize the system and manage yearly upgrades, migrate data from legacy systems brought along with their acquired practices and developed clinical reporting to allow the electronic data to drive actions and improve patient care. In 2015, Baumbach transferred to BJC’s Center for Clinical Excellence. Baumbach is the operations manager for the Transformation Support group, a 30-member internal consulting group that partners with the hospitals and across the healthcare system to achieve operational excellence. They provide project management, process improvement through lean and Six Sigma, and facilitation and change management services. Many of the consultants are engineers. The mission of caring for people drew Baumbach to healthcare and it still motivates her. “I enjoy the challenge of healthcare through supporting the efforts at BJC to improve operations for our staff and providers, and in turn improve health for the patients and communities we serve,” she says. Even though they don’t see patients in their line of work, for both Baumbach and Selden, the work all comes down to people.